ACUVAIL™ (ketorolac tromethamine ophthalmic solution) 0.45% is a member of the pyrrolo-pyrrole group of nonsteroidal anti-inflammatory drugs (NSAIDs) for ophthalmic use. ACUVAIL™ solution is supplied as a sterile isotonic aqueous 0.45% preservative-free solution, with a pH of approximately 6.8. One drop of ACUVAIL™ should be applied by the patient to the affected eye twice daily beginning 1 day prior to cataract surgery, and continued through the first 2 weeks of the postoperative period. Inactives: Carboxymethylcellulose; sodium chloride; sodium citrate dihydrate; and purified water with sodium hydroxide and/or hydrochloric acid to adjust pH. ACUVAIL™ ophthalmic solution is a nonsteroidal, anti-inflammatory indicated for the treatment of pain and inflammation following cataract surgery. 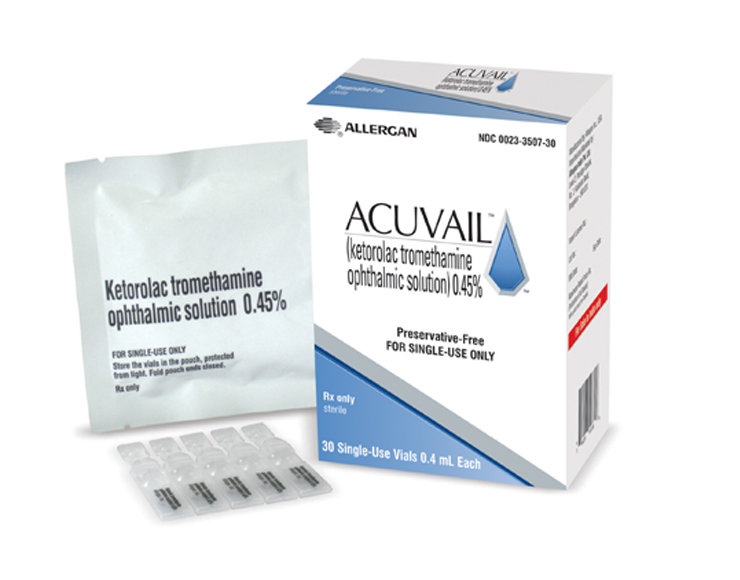 ACUVAIL™ (ketorolac tromethamine ophthalmic solution) 0.45% is available as a sterile solution supplied in clear, LDPE, single-use vials packaged in a foil pouch: 15 Single-Use Vials 0.4 mL each.